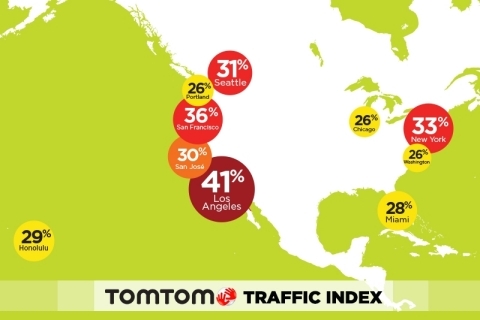 TomTom Traffic Index Finds Los Angeles, San Francisco, New York Most Traffic-Jammed Cities in the U.S.
Smoothest commutes: Dayton, Ohio, and Knoxville, Tenn.
BURLINGTON, Mass.--(BUSINESS WIRE)--TomTom (TOM2) – today released the results of the TomTom Traffic Index 2016, the annual report detailing the cities around the world with the most traffic congestion. And the news this year is that America’s biggest West Coast cities are mired in traffic-clogged commutes, and booming metro areas in the South are not far behind. Los Angeles ranked No. 1 for having the nastiest gridlock, ahead of San Francisco, New York, Seattle, San Jose and Honolulu. The TomTom Traffic Index found that Los Angeles had an overall congestion level of 41 percent last year, meaning the extra travel time on both highways and non-highways anytime of the day vs. free-flowing conditions. That’s up from 39 percent in 2014. The drive was worse during rush hours. In Los Angeles, a typical half hour commute took 81 percent longer during evening peak periods and 60 percent longer during the morning peak. For weary drivers in Southern California, traffic jams added up to 164 hours of extra travel time per year – almost a full week stuck in their cars. The study found that Seattle had the country’s second-worst evening rush hour congestion with a 75 percent increase in travel time, followed by San Jose (74 percent), San Francisco (69 percent) and Houston (66 percent). The overall congestion level in the Top 10 cities averaged 31 percent, about the same as last year. TomTom experts attributed that to new traffic management policies, investments in infrastructure and more flexible working schedules to make up for more traffic from job growth and bad weather. Drivers in some cities even enjoyed a reduction in traffic congestion from last year, including Las Vegas, Denver, Tucson, St. Louis, Detroit, Minneapolis and Milwaukee. The TomTom Traffic Index – now in its fifth year of public release – is so detailed that it breaks down not only the best and worst times to hit the road but also which days are the most traffic-clogged – a boon for motorists looking for an edge to make good time safely. “We really want everybody to think about how they can lower the amount of time they waste in traffic every day – and to realize that we all need to play a part,” said Ralf-Peter Schaefer, vice president of TomTom Traffic. “We can help businesses plan smarter working hours to help their employees avoid traveling during rush hour. And we give drivers the real-time traffic information and smart routing they need to avoid congested roads and get to where they want to be, faster,” Schaefer said. Using data from 2015, the TomTom Traffic Index assessed traffic congestion in 295 major cities in 38 countries on six continents – from Rome to Rio, Singapore to San Antonio. TomTom works with 14 trillion data points that have been accumulated over eight years. The full Top 10 ranking for most congested big cities: Los Angeles, San Francisco, New York, Seattle, San Jose, Honolulu, Miami, Washington, D.C., Portland, Ore., and Chicago. Some of them – Honolulu, Washington and Chicago – recorded a slight improvement in the overall traffic driving time from last year. But the leaders, Los Angeles, San Francisco and New York, each got worse. Fast-growing cities in the South also ranked high, including Houston (11th on the overall congestion list), Atlanta (13), Tampa (15), Orlando (16), Baton Rouge, La. (18), Nashville (19) and Austin (21). Cities enjoying the smoothest commutes were Midwest mainstays: Kansas City, Indianapolis, Omaha-Council Bluffs, Iowa, and Dayton, Ohio. TomTom, based in Amsterdam, has worked with travel planners worldwide, offering the traffic data to help enhance mobility plans, smart city strategies and public transit and infrastructure. The information, gathered in part from navigational devices, also can be used by motorists at peak traffic periods to consider different departure times to avoid hang ups or to use other means of travel. Based on TomTom’s historical data, traffic congestion has increased 13 percent globally since 2008. But there are big differences between continents. While North America’s traffic congestion has jumped by 17 percent, Europe as has gone up just 2 percent. The contrasts probably are driven by economic growth in North America, and financial troubles in the many parts of Europe. In particular, some countries have recorded a marked drop in traffic over the past eight years, including Italy (-7 percent) and Spain (-13 percent). The TomTom Traffic Index, individual city rankings and the congestion levels can be accessed at tomtom.com/trafficindex. There’s also helpful advice on beating traffic and, for the first time, a selection of “Profile Cities” that provides insight into what they are doing to improve mobility. What does TomTom do to beat congestion? Road authorities and local governments can use TomTom’s traffic data to better manage traffic flow during the rush hour. We can help businesses plan smarter working hours to help their employees avoid travelling during rush hour. And we give drivers the real-time traffic information and smart routing they need to avoid congested roads and get to where they want to be, faster. How does TomTom calculate congestion level? Put simply, the Congestion Level percentage is the extra travel time a driver will experience when compared to an uncongested situation. To illustrate, an overall congestion level of 36 percent means that an average trip made takes 36 percent longer than it would under uncongested conditions. At TomTom (TOM2) our mission is to make technology so easy to use that everyone can benefit from it. We created easy to use navigation devices, helping millions of people to get where they want to be. Today, we continue to simplify the complex, making technology more accessible for everyone. We have four customer facing business units: Consumer, Telematics, Automotive and Licensing. We make easy to use navigation devices, sport watches and action cameras for consumers. We enable businesses with vehicles to more easily manage and improve fleet efficiency whilst increasing overall business performance with our Telematics solutions. We also offer a world leading real-time map platform that is powering innovative location based services and helping to make automated driving a reality for the automotive industry. Founded in 1991 and headquartered in Amsterdam, we have over 4,600 employees and sell our products worldwide.